Our latest news, updates and ideas. Why do I need a bin tipping machine? I’ve emptied our wheelie bins for years using plain old elbow grease, and never had a problem. Why should someone now tell me I have to use a machine? We hear this occasionally, and understand the sentiment. If you’ve manually lifted bins for years and never suffered so much as a tweaked muscle, purchasing a machine to do the job might seem an unnecessary investment. It is, however, a question of perspective. Zoom out from your own example, and the statistics begin to tell a tale – exactly the same tale they once told about seatbelts and smoke alarms. They say that the cost of injuries sustained by manually lifting bins dramatically outweighs the cost of a tipping machine. I’ve driven for years, and never had an accident. Why should someone now tell me I have to wear a seatbelt? Humans naturally evaluate risk using past experience – rather than big-data analysis – and it actually works quite well. However, many studies have shown that at extreme ends of the risk/reward scale our ability to make rational decisions becomes impaired. Instead of logic, we rely increasingly on instinct or superstition. This is a type of cognitive bias. Cognitive bias explains why responsible adults choose to drive drunk, why healthy people take up smoking, savvy investors buy shares far above their real value, and the desperately poor buy lotto tickets every week. It also explains why smart managers sometimes decide not to invest in health and safety. If something happens infrequently, we assume it just doesn’t happen at all. The statistics, however, are unanimous: manually lifting and emptying heavy bins is one of the most dangerous and costly exercises in the modern workplace. 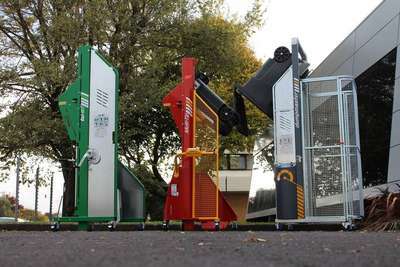 The Health and Safety department of Catholic Education Brisbane (an Australian schools group with 70,000 students) identified that staff injuries from manually emptying wheelie bins were resulting in an average time off work of 46 days at a direct cost of AUD$4,470. They issued a policy forbidding the practice. A 2005 study commissioned by WasteMINZ (Waste Management Institute New Zealand) estimated that in the 10 months from July 2004, 57 injuries occurred in the NZ waste collection industry which could be related to manual handling of bins and bags – at a cost of NZD$2.4 million. A 2010 European Union report estimated that work-related musculoskeletal disorders were costing between 0.5% and 2% of EU Gross National Product. The report estimated that in 2006, seven million workdays were lost to WRMSDs in France alone. Consider also the lifespan of your investment. Whereas IT equipment is typically obsolete after three years, bin tipping equipment from Simpro is often still in everyday use more than two decades later. We know this, because we’ve made these machines since 1986. When you are able to amortize your investment over decades rather than months or years, the cost becomes negligible. When you also factor in the injuries prevented and the happiness of your staff, the ledger moves very much into positive territory. That’s why dozens of leading organisations use Simpro bin tipping machines: from Rolls Royce Plc, Coca Cola, Nestle and Air New Zealand, to Kristin School, The University of Melbourne and Orewa College. Ask your nearest Simpro agent for a quote today.